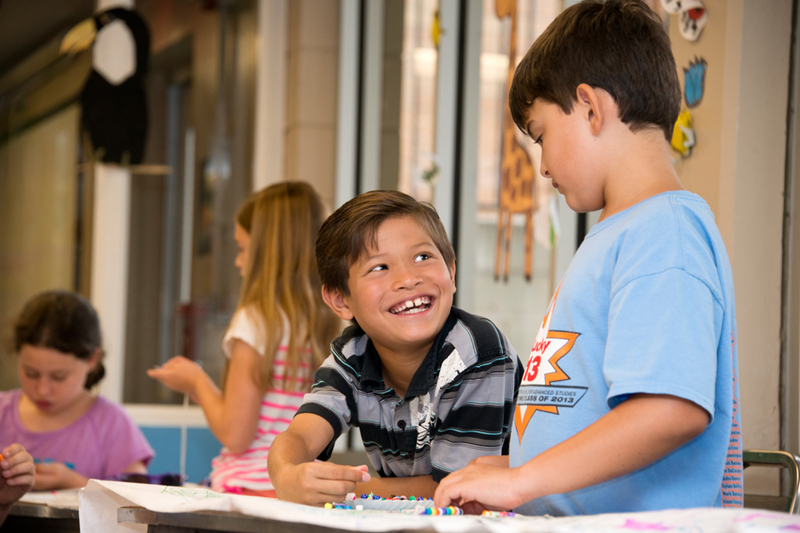 Students enjoy arts and crafts activities at Sunny Days Camp. Photo by Lee Choo. Parents searching for innovative summer programs can now register their children for a creative, fun and unforgettable learning experiences at California State University, Northridge. CSUN’s summer camps offer children the opportunities to discover a new love for learning, design robots, explore the world of culinary arts, dabble in the art of pottery, develop rock climbing skills, attend field trips and engage in new sports. Registration has opened for the university’s Summer Academic Program for Elementary School Students (SAPESS) offered to children in grades entering kindergarten through five. The kindergarten class is held in the same classroom all day at the Children’s Center, where students participate in age-appropriate activities that cover all the academic subject areas. Students in grades one through five rotate through four different classes each day. The classes include language arts, math, science, and arts and crafts. SAPESS coordinators Phil Shaffer and Jill Frieze said each class offers a variety of fun, creative, and hands-on activities. All classes are taught by credentialed teachers and students are supervised by experienced teacher assistants, many of whom are also credentialed. Frieze and Shaffer said each week focuses on a different exciting theme. The five themes are “Superheroes and Villains,” “The Four Elements,” “Fun and Games,” “Dr. Seuss,” and “To Infinity and Beyond.” Teachers collaborate to plan and incorporate these themes into the subject areas. The projects are all high-activity based. There is no testing, no homework, and no workbooks. For more information, visit the SAPESS website. For middle and high school students the Summer Academic Enrichment Program (SAEP), is designed to help the student develop a passion for learning, as well as earn high school credit. The SAEP’s enrichment program (not for credit) is for middle school students and the academic program is for high school students offering high school courses for credit. The courses include algebra II, geometry, chemistry, health and SAT prep for Mathematics and language arts. The enrichment program, for students in grades six to eight, offers them courses in language arts, computers, foreign language, mathematics, science, visual and performing arts, leadership skills and study skills. For more information, visit the SAEP website. SAEP and CSUN’s robotics club and engineers teamed up to offer a robotics camp. The camp will start June 12, and end June 16. During the week, students will learn how to create a VEX robot, which will then compete with robots built by other students. For more information, visit the SAEP robotics camp website. SAEP also is partnering with CSUN’s Department of Family and Consumer Sciences to offer a new culinary camp for students in grades sixth to ninth. The camp will run June 12-16. Students will get hands-on experience while learning about food science and nutrition. The half-day camp will be taught by students in CSUN’s Marilyn Magaram Center for Food Science, Nutrition and Dietetics. For more information, visit the SAEP culinary camp website. CSUN’s Sunny Days Camp, a program for elementary school students age 4 to 11, is also open for registration. The program offers a variety of activities, ranging from field trips and sports play, rock climbing and group dance activities. The camp offers nine weeks of camp sessions from June 11 to Aug. 12. For pricing information on full and half-day camps, visit the Sunny Days website. For kids interested in staying active, Matador Athletics offers camps in soccer, tennis, softball, volleyball, basketball and baseball. Children and teens who live with disabilities will be accommodated in the baseball camp, according to coach Riley Goulding. “We can accommodate children who live with disabilities based on their needs. We would love to have everyone out there,” said Goulding. For more information, visit the athletics camp website. For teens interested in theater, CSUN’s award-winning Teenage Drama Workshop (TADW) offers students in seventh through twelfth grade a chance to be trained and taught by theater professionals. For six weeks, students will engage in intensive training in dance, acting, costume design, lighting and sound design. “Teenage Drama Workshop has a wonderful family and inclusive spirit,” said director, Douglas Kaback. TADW will also offer performances to accommodate families with children with disabilities. “We also do a special performance called our sensory friendly performance,” said Kaback. “Sensory friendly is a different kind of way of presenting the show. We’re particularly focusing on families who might have children on with special need. We try to make accommodations so it’s open and friendly and not harsh in lighting or sound effects. For more information, visit the TADW website.